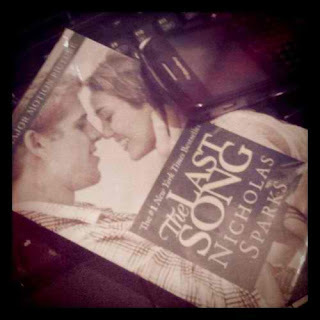 I just finished reading The Last Song by Nicholas Sparks a few minutes ago. And again, it did not fail to make me teary eyed at some point. I've been dying to read this novel since I finished watching it's film adaptation. And somehow, the book turned out into something unexpected. The story is told in alternating perspectives. From Ronnie (Miley Cyrus) to Will (Liam Hemsworth) to Steve (Greg Kinnear) and Marcus (Honestly, I could care less about this character). I honestly loved this book as much as I loved the movie. I think the actors did a great job at portraying the characters in the book. It made me appreciate Miley Cyrus as a dramatic actress. Anyway, the character of Ronnie is a complex one. She can be nice, mean, good, bad blah blah. As I've said she's complicated. There were times when I simply wanted to smack her for being the way she is. But as I continued to move towards the end I ended up appreciating her even more. All the rebellious teen with all the angst disappeared and she grew up to be a fine young woman. I honestly loved her more in the book. Coming from a broken family myself I think this book made me appreciate my parents even more. Especially my dad since we're not exactly the best of friends in real life. We don't fight a lot or anything we simply just don't care enough to talk to each other like Steve and Ronnie. Honestly, I envy her relationship with her dad. Then there's Will. I really liked Will in the novel more. I think he was under appreciated in the movie since the movie focused more on Ronnie. Don't get me wrong though, I honestly think Liam Hemsworth did a great job at portraying Will. I just think he should have been given more spotlight in the movie. In the novel he was not just portrayed as the boyfriend of the main character. He was given more page time and by doing so I was able to get to know the complexity of Will's character. His inner struggles were also given light in the novel and I think that's what made me love him even more. Plus, the fact that I see him as Liam Hemsworth! haha. And of course, there's Steve, Ronnie's dad. I seriously love him from page one. Probably because I've seen the movie first. I don't know. I just admire his strength and his love for his children. I loved the fact that he tried reaching out to his children after leaving them and all. His death seriously broke my heart. I just love him and I cried as I read his letters to Ronnie. And lastly, there's Marcus. I could care less about this character. I hated him in the movie and I hated him more in the book. He's a manipulative psycho and he has no conscience. I wanted this character to die a very painful death. Honestly, I don't even have anything nice to say about this character. Overall, I think all of the characters were written very well. I think their growth and progress as individuals were written wonderfully. I loved the ending in the book as much as I loved it in the movie. I think this is one of those instances when I can't choose between the movie and book adaptation. I loved both equally. Differences and all. I think this book has a lot of morals in it since it's about the different forms of love and forgiveness. I think the world would be a better place if everyone simply learned how to love and to forgive. Anyway, I'd give this a 4/5 star rating.